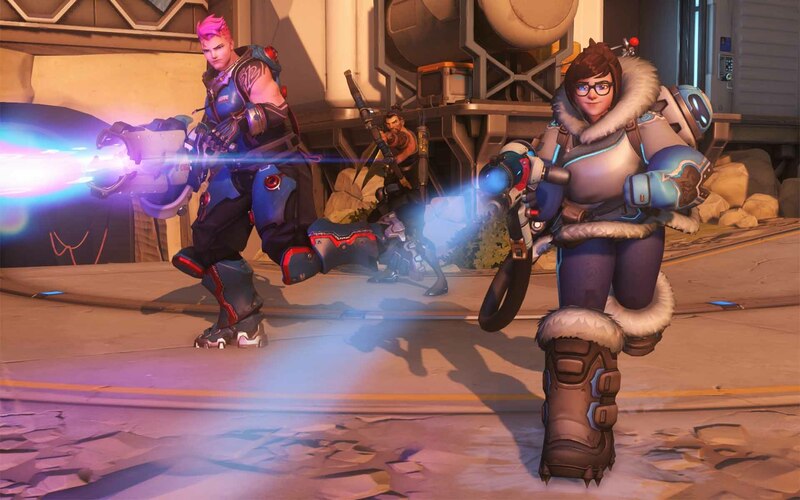 Mei is labelled as a defense character, but her role on the team is very different from that of a Torbjorn, Bastion, Widowmaker, Junkrat, or Hanzo. While other defense characters focus on being able to defend a point by fortifying an area with stationary defenses or unparalleled long-range capabilities, Mei's job is to provide utility to her team and be a disruptive force on the battlefield, rather than rack up kills for herself. Her main weapon is a freeze gun that can fire a short range stream of icy air that will slow an enemy down and eventually freeze them solid. Its secondary fire is a long range blast that has the same effect. Neither attack does much damage, but the slow is substantial and can be very problematic for characters that rely on their speed to keep them alive, like Tracer and Lucio. Her "E" is a move that will be familiar to anyone who plays nearly any MOBA. It's an ice wall! Mei's ice wall provides some interesting utility for those who are able to communicate and work together. It can seal up one of the entrances at the start of the game, prompting enemies to go through another entrance where you could have your defenses waiting; it can be used as a platform to boost up characters to high places that those characters might normally not be able to reach; it can be used to shield your allies from a Bastion or Widowmaker's line of sight and allow them to enter a path that's normally heavily guarded. There are a wide variety of interesting uses for it, but all require a level of coordination that is hard to achieve if you're playing with a bunch of random strangers. 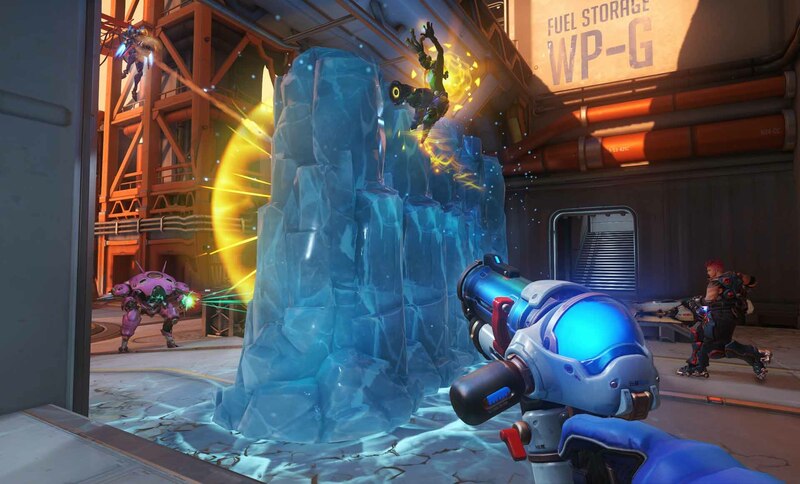 Mei is not one to actively go seeking a fight, but when a fight finds her, she's able to use her "Cryo-Freeze" ability to encase herself in impenetrable ice for several seconds, gaining nearly all of her life back in the process. It's an important move for Mei as she doesn't have a huge amount of HP, and it allows her to take the aggro off of herself in a team fight. Once her ultimate is charged, Mei really change the tide of a team fight by tossing out a device that will slow and eventually freeze all enemies in a wide radius while dealing substantial damage over time. Mei is a tricky character to use effectively, and is the very definition of a team player. Good communication is essential when Mei is on the team in order to maximize her utility.